Four images from New Horizons’ Long Range Reconnaissance Imager (LORRI) were combined with color data from the Ralph instrument to create this global view of Pluto. 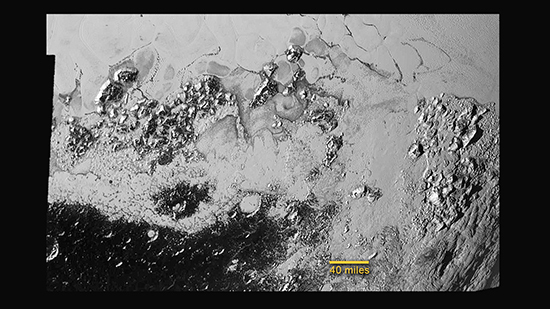 (The lower right edge of Pluto in this view currently lacks high-resolution color coverage.) The images, taken when the spacecraft was 280,000 miles (450,000 kilometers) away, show features as small as 1.4 miles (2.2 kilometers), twice the resolution of the single-image view taken on July 13. 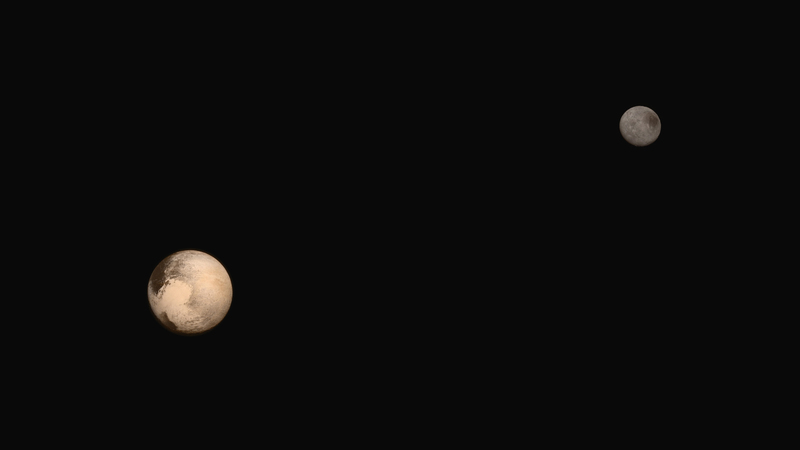 Four images from New Horizons’ Long Range Reconnaissance Imager (LORRI) were combined with color data from the Ralph instrument to create this global view of Pluto. The images, taken when the spacecraft was 280,000 miles (450,000 kilometers) away, show features as small as 1.4 miles (2.2 kilometers). Four images from New Horizons’ Long Range Reconnaissance Imager (LORRI) were combined with color data from the Ralph instrument to create this global view of Pluto. 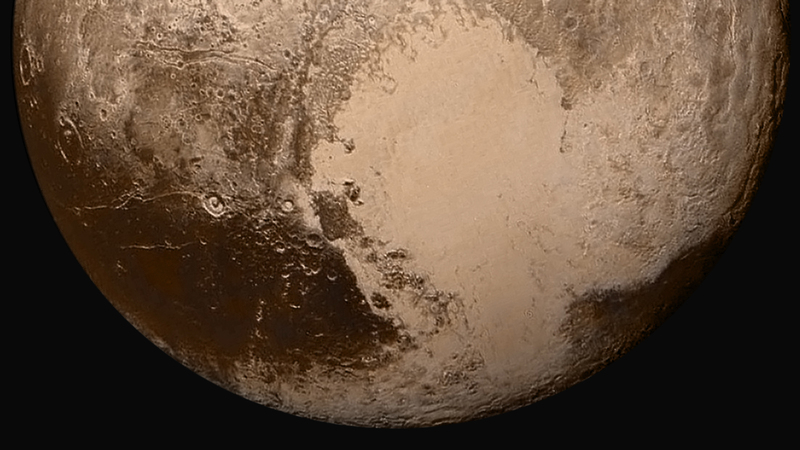 (The lower right edge of Pluto in this view currently lacks high-resolution color coverage.) The images, taken when the spacecraft was 280,000 miles (450,000 kilometers) away, show features as small as 1.4 miles (2.2 kilometers). Four images from New Horizons’ Long Range Reconnaissance Imager (LORRI) were combined with color data from the Ralph instrument to create this enhanced color global view of Pluto. 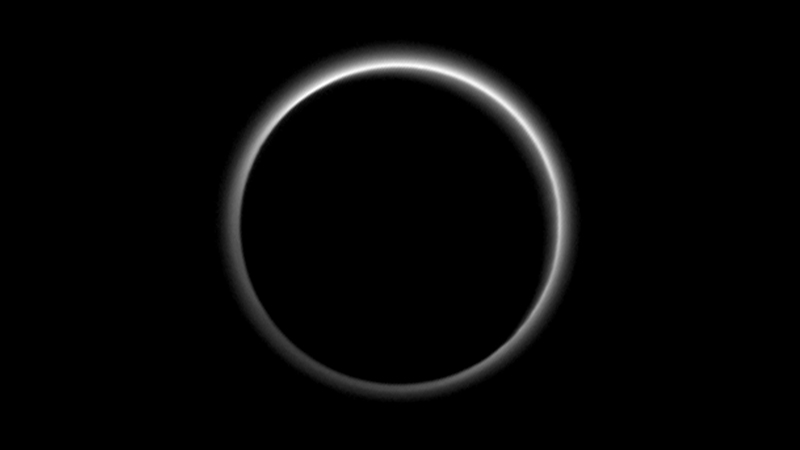 (The lower right edge of Pluto in this view currently lacks high-resolution color coverage.) The images, taken when the spacecraft was 280,000 miles (450,000 kilometers) away, show features as small as 1.4 miles (2.2 kilometers). 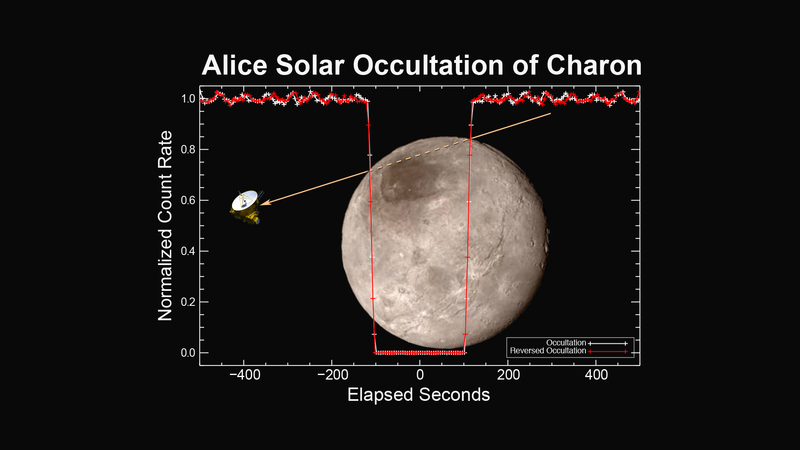 Searching for signs of an atmosphere around Pluto’s largest moon Charon, New Horizons’ Alice instrument observed Charon passing in front of the sun—an event called an occultation—on July 14, 2015. Only a portion of the occultation data has been transmitted to Earth so far; in that limited dataset, an atmosphere has not yet been detected. 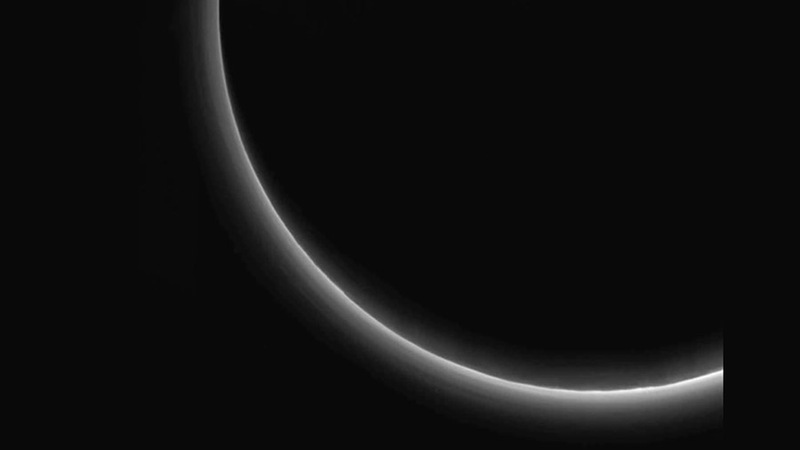 Backlit by the sun, atmospheric haze rings Pluto’s silhouette like a luminous halo in this image taken by NASA’s New Horizons spacecraft around midnight EDT on July 15. 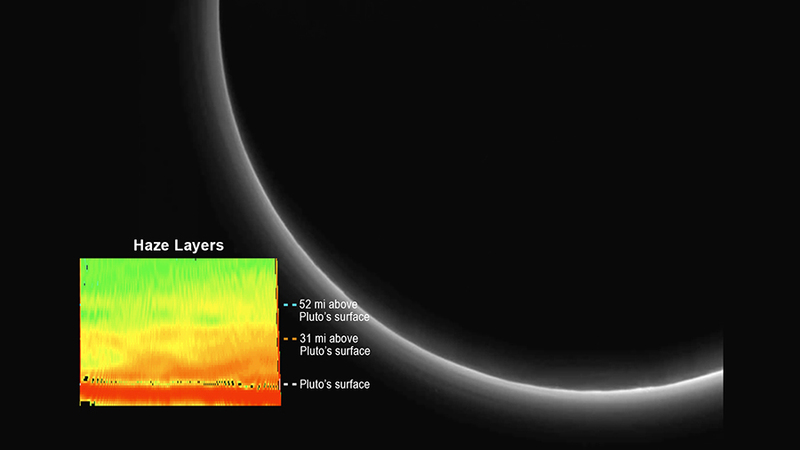 This global portrait of the atmosphere was captured when the spacecraft was about 1.25 million miles (2 million kilometers) from Pluto and shows structures as small as 12 miles across. The image was delivered to Earth on July 23. 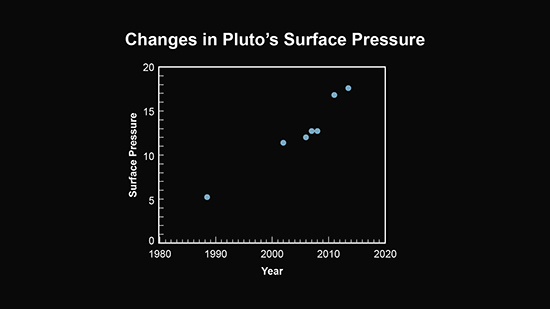 Chart indicating changes in Pluto’s surface pressure over time. 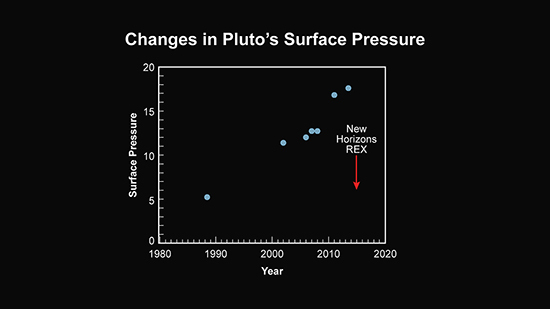 Chart indicating changes in Pluto’s surface pressure, marking time of the New Horizons radio science (REX) measurements. Four images from New Horizons’ Long Range Reconnaissance Imager (LORRI) were combined with color data from the Ralph instrument to create this enhanced color global view of Pluto. (The lower right edge of Pluto in this view currently lacks high-resolution color coverage.) The images, taken when the spacecraft was 280,000 miles (450,000 kilometers) away, show features as small as 1.4 miles (2.2 kilometers), twice the resolution of the single-image view taken on July 13, 2015. 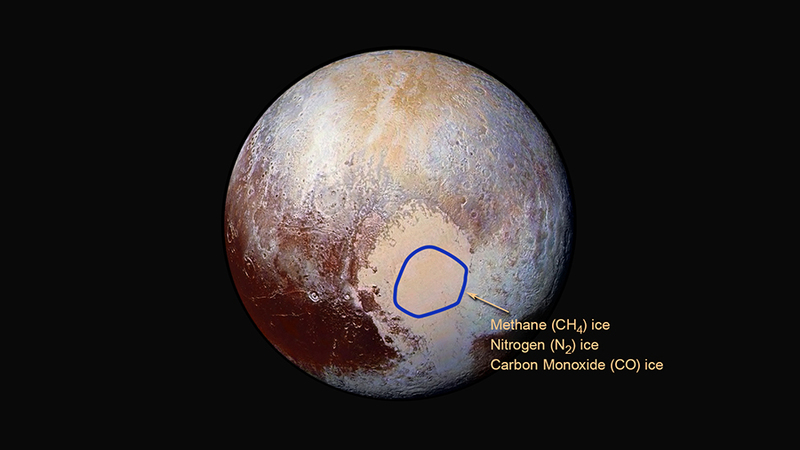 Within the circled region of Pluto’s Sputnik Planum, New Horizons Ralph instrument has detected frozen methane, nitrogen, and carbon monoxide. 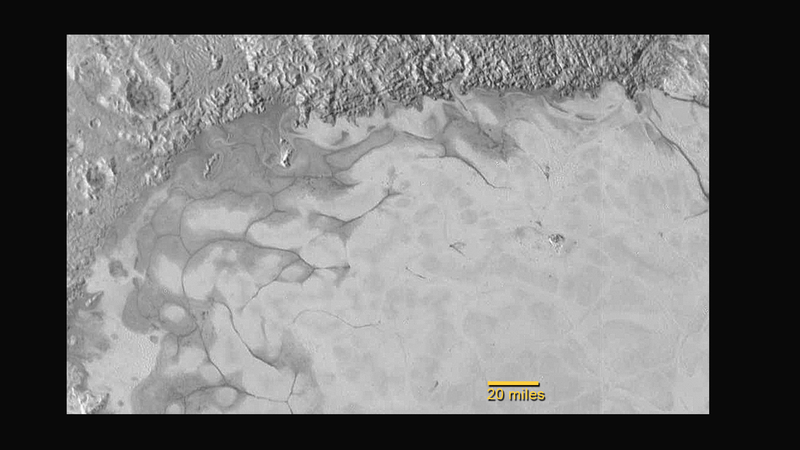 This animation shows the location of a new mosaic of seven images that were acquired by New Horizons’ Long Range Reconnaissance Imager (LORRI) on July 14. 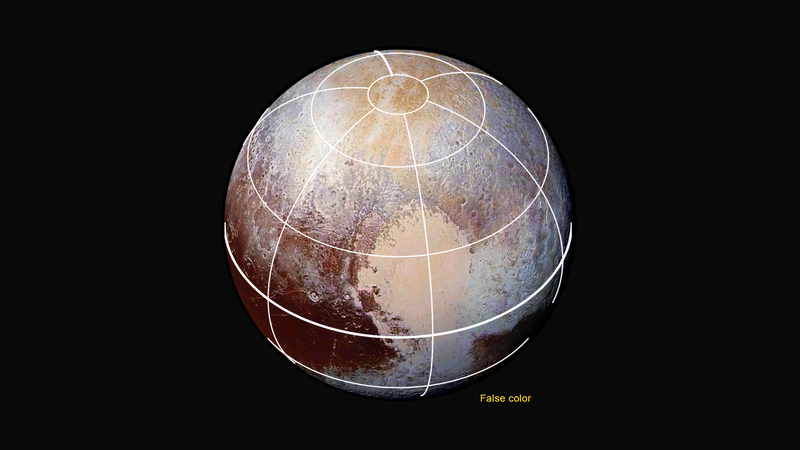 The mosaic covers the vast icy region informally named Sputnik Planum (Sputnik Plain), lying within the heart-shaped feature informally named Tombaugh Regio (Tombaugh Region). 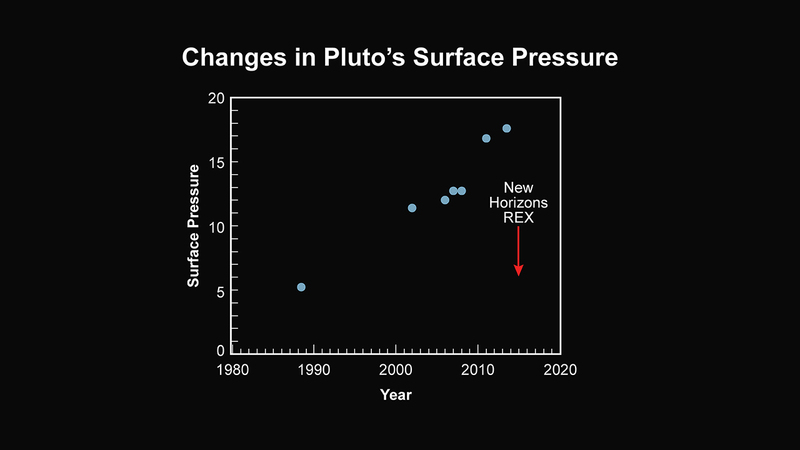 Credit: NASA-JHUAPL-SWRI. 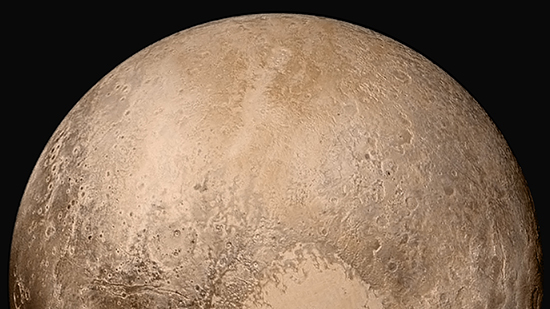 Mosaic of seven images that were acquired by New Horizons’ Long Range Reconnaissance Imager (LORRI) on July 14, covering the vast icy region informally named Sputnik Planum (Sputnik Plain), lying within the heart-shaped feature informally named Tombaugh Regio (Tombaugh Region). Credit: NASA-JHUAPL-SWRI.. The orange rectangle shows the location of features in the north region of Pluto’s Sputnik Planum. Annotated image of the northern region of Pluto’s Sputnik Planum, swirl-shaped patterns of light and dark suggest that a surface layer of exotic ices has flowed around obstacles and into depressions, much like glaciers on Earth. 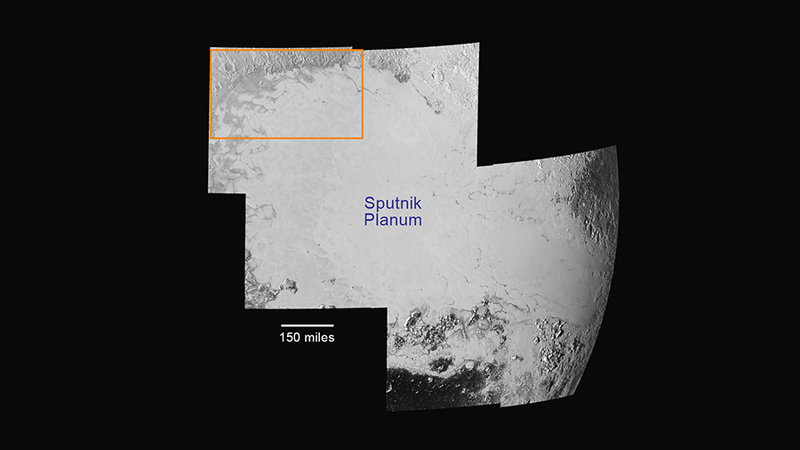 The orange rectangle shows the location of features in the southern region of Pluto’s Sputnik Planum. The southern region of Pluto’s Sputnik Planum contains newly discovered ranges of mountains that have been informally named Hillary Montes (Hillary Mountains) and Norgay Montes (Norgay Montes) for Sir Edmund Hillary and Tenzing Norgay, the first two humans to reach the summit of Mount Everest in 1953. Annotated image of the southern region of Pluto’s Sputnik Planum. The large crater highlighted in the image is about 30 miles (50 kilometers) wide, approximately the size of the greater Washington, DC area.